The Set-up: It’s Friday night Jeffrey’s on the way home and Ina is refusing to cook their traditional chicken! This can only mean the collapse of civilization. Or steak throwdown. 0:42 – Ina begins by sharing a dark secret: she’s been cooking Jeffrey chicken on Friday nights for 42 years, and she’s “sick of it.” Talk about shaking my worldview. 2:51 – She heats a mixture of heavy cream and whole milk to a boil before adding a few tablespoons of white wine vinegar which causes the milk to separate into “curds and whey” an immediately turns us into nursery rhyme characters. 3:03 – This looks pretty disturbing – Ina calls it a “bowl of mess.” True statement. Let’s hope she knows what she’s doing! 3:45 – Cut to Jeffrey driving home. He’s says last time they grilled there were “a few problems and a few critiques.” The significant glance we get at the end of that statement is priceless as are the shots of him shopping for charcoal. “I hope this is right…” 42 years people! 5:05 – Ina’s telling us a story as she chops herbs about the time a friend asked her for a cooking lesson as a birthday present (very clever girl) and this was the recipe they made together. I would have requested an Ina classic like roast chicken or chocolate cake. You know, in case I ever get the chance to cook with Ina. 6:11 – The ricotta is done straining and Ina has stirred in scallions, dill, and chives – it actually looks really good. 9:07 – Watermelon Mojito time! Ina’s inside whipping up a batch while Jeffrey lights the grill. He has a charcoal chimney – so someone’s looking out for him. We had one in Texas and literally anyone who you’d trust with a match can get charcoal started with this thing – it’s amazing. 10:13 – I like Ina’s ratios for these cocktails – 1.5 cups of light rum : 2 cups of watermelon puree and a little lime juice and simple syrup for flavor. Boozy. 12:30 – Back outside to Jeffrey who is hilariously narrating the final stages of grill set-up: “I pour out my coals with the greatest finesse…evenly spread…put the grill down. How easy is that?” He sticks the landing. 13:16 – Out to the terrace to grill the bread for the bruschetta and deliver a mojito to Jeffrey. Jeffrey shoots one more significant look at the camera – he’s really hamming it up – as Ina inspects the grill. 13:32 – Talk turns to the powers of a cocktail to render the taste of anything irrelevant and its effect on ‘The Griller’s’ cooking abilities. Jeffrey thinks he might be barbecuing himself. Unclear whether this is literal or figurative barbecuing. 19:11 – Ina offers Jeffrey some tips (5 min per side, test with a thermometer – 125 degrees is the goal for medium rare) He’s suspicious that sabotage is involved… I would be too; she looks pretty cutthroat. 20:17 – Inside Ina shows us her method – cast iron skillet for the win! – 2 minutes each side and along the edges for a total of 10 minutes. At this point she realizes she ‘forgot’ to tell Jeffrey about putting butter and wonders oh, so innocently if that’s ‘cheating?’ He was right to be suspicious! 23:18 – Time for the big reveal – Ina seems shocked that Jeffrey’s steak looks so good and tries to throw him off his game one last time by offering a butter knife to carve. Wicked until the end! She serves the steaks over arugula with shavings of parmesan. 24:21 – Jeffrey goes first and proclaims himself the winner. Not so fast, my friend. Ina goes next and her steak is definitely juicier (ahem, butter.) She fesses up about the butter and Jeffrey claims her steak as the penalty of cheating. Seems fair. 28:15 – Ask Ina time and it’s all grilling questions. Question 1: Why does Ina use a charcoal grill instead of gas? She says it’s because she likes the flavor charcoal imparts to the food. Amen, sister – charcoal all the way. 28:57 – Question 2: How do you keep from over or under cooking meat when grilling? Ina gives two options here – either very low heat charcoal so the meat doesn’t burn before it cooks through, or start roasting the meat in the oven and then finish it on a very hot grill to get the sear and charcoal flavor. 29:01 – Question 3: What method to you use to cook tuna steaks? Ina says brush the tuna with olive oil, sprinkle with salt and pepper, and on really hot grill or a cast iron pan cook on each side for 2 – 2½ minutes. This gives a good sear to the outside, but leaves the center raw. Happy grilling! I really can’t stress enough that Ina’s restaurant-style steak method is the BEST – yes, bold, all caps, and italic worthy. Definitely try this next time you have steaks. Jeffrey and Ina’a teasing and jokes during the ‘Grilled Steak Throwdown’ kill me. Obviously, 50% of the game is mental. Full disclosure: I thought about making steak using Ina’s method, but it wouldn’t actually have been a test since this is how we always make filets in the Messersmith household. I can’t recommend it enough – no more burned, dried out meat. Salt & Pepper + a good sear = great flavor, and with a little adjustment in the oven cooking time everyone gets their steak cooked the way they like it. Mike prefers more medium/ medium-rare (hot red) so his comes out first, where as I’m a solid medium-well (hot pink) kind of girl so we give mine an extra few minutes. So, in the interest of trying something new I made the Herbed Ricotta Bruschetta including the homemade ricotta step. It actually is as easy as Ina makes it look and she’s right about the science experiment part. When the milk/cream/vinegar mixture has curdled it looks like something gone horribly wrong, but trust the process. Since we don’t have a grill I did the bruschetta in the oven (400 degrees, 5 minutes per side) and it came out nicely browned. One important note: the milk/cream mixture goes from quietly simmering along to nearly boiling over in about 10 seconds, so watch carefully when you’re heating it! Luckily, I was paying attention turned off the flame before I had a stovetop mess on my hands. You’ve been warned! Definitely. I used one medium sauce pan, one sieve, a piece of cheese cloth, a medium bowl (washed in between draining and mixing), one small cutting board and a baking sheet. For utensils I used a chef’s knife, bread knife a wooden spoon, pastry brush, and a liquid measuring cup and measuring spoons. Mike and I had the Herbed Ricotta Bruschetta as a little afternoon snack and were both really happy with the flavors. 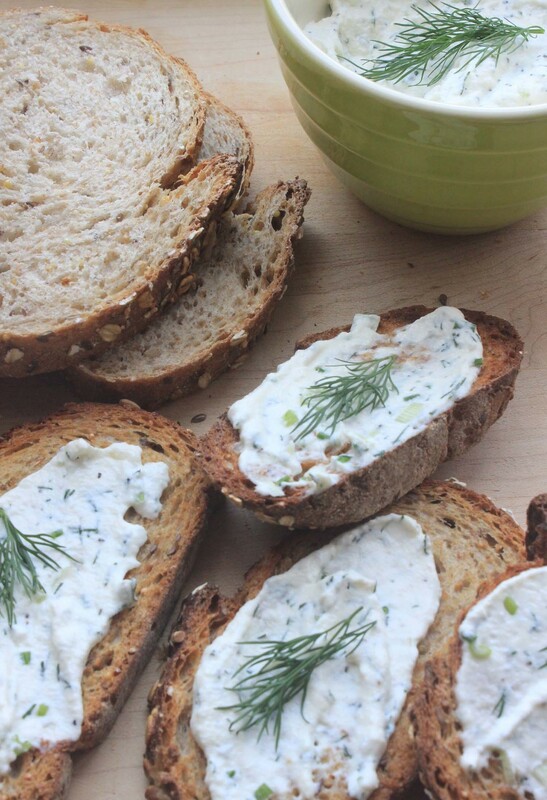 The homemade ricotta is delicious even before the herbs are added and the flavor combination is fresh and summery, plus contrast of cool spread/warm bread is perfect. This is an easy one to size up or size down (I halved the recipe since it was just the two of us) and simple to make ahead if you have guests. I’d definitely make this as an appetizer or for a cocktail party snack.